New Haven brandishes the scars of its imperial past like racy tattoos on wrinkled skin. Along with our quaint New England architecture and char-dusted pizza, we boast our grisly tradition of extolling whiteness in a display of perverted anachronism. In my city, black communities thrive - or scrape by - on streets called Dwight, Davenport, Dixwell, Whalley, and Goffe: all named for prominent, sometimes slave-owning English men. Folks who wear that brand of colonial whiteness skirt around parts of town marked by dark faces, places nicknamed "the Jungle," "the Congo," and "the Ghetto." Gripping their Starbucks' and their iPhones, they zigzag their way across downtown: treating CT Transit signs like crossing signals, they avoid sharing air with the women and men who depend on the bus to get to work. "Watch the stampede," I was cautioned while visiting a public elementary school. I smiled when dozens of energetic children burst through the cafeteria doors, running and skipping to recess. These public school kids, 83 percent of whom are black or Latino/a, were likened to beasts - paralleling the imperialist labels for the neighborhoods in which they and their parents live. For $37,550 a year, the fruits of white privilege can realize Edward Hopkins and John Davenport's dream of "breeding up of hopeful youths... for the public service of the country in future times". These 'hopeful youths' head for the nation's most elite universities while many of their public school counterparts fail to meet state achievement standards. When the mid-century 'Great Black Migration' disrupted white control, oppression took on a new look. Exclusionary land use, rising housing costs, and the 'convictions box' on job applications for major employers like Yale New-Haven Hospital have ensured that people of color remain excluded from the mainstream. Within a few days of arriving in New Haven last August, I had already received my indoctrination into this system of separatism. "You can tell when you're at Yale... and when you're not at Yale," the police sergeant told us during the security orientation, her voice rising at the tail of each phrase. "And when you're not at Yale, we can't protect you." I narrowed my eyes. I could tell the difference between Collegiate Gothic and Post-Modern. I knew the campus boundaries. And I also knew that crowned windows and manicured lawns would not guard me from crime. The sergeant veiled her words, but her point was transparent: any threat to our safety comes from the 'others' that fall outside the privileged elite they had taught us to consider ourselves a part. "Yale" was a group, not a place; a marker of merit, a badge of belonging built on the 'accomplishments' of white imperialists. Once this clicked, a blitzkrieg of questions ignited my mind. If I live outside of Yale-land, will the Yale police care if my home is robbed? If my black male classmate wears his pants too low, will he arouse suspicion from Yale security? If I am harassed near the bus stop, will an officer speak up - or presume it was an intra-class crime? My answers came fast. My peers living on Congress Avenue - "the Congo" - were told they could not benefit from the free shuttle services because their neighborhood was out of district. In my first year at school, Yale police accosted a black college junior at gunpoint while he was leaving the library because he looked like a burglary suspect. When I mentioned to a professor the daily catcalls I encounter on my walk to class, she suggested, "Maybe you should avoid being in their space," referencing the men who make their livelihoods with the help of public transit. Each of these acts propagates a legacy of control that favors whiteness, wealth, and un-womanness. When authorities actualize the fable that we are different from them, the seesaw of power raises whites even higher and teaches them to see people of color in their shadow. As newcomers learn to fear their new, dark-complexioned neighbors, misunderstanding and ignorance deepen. When children of color in New Haven find that white people in power prefer white accomplishments, they aim for the approval of their own in-group - and by white-imposed metrics, they 'underachieve'. White supremacy reaches far beyond the Confederate flag. While overt and organized hatred form the geysers of systemic racism, our ongoing failure to resist the relics of our oppressive past pressurizes the water. I find myself ever more critical. In each situation, I want to know: who has the power? At whose expense? What systems have made it this way - and am I okay with them? In what ways am I complicit - and how can I stand against it all? 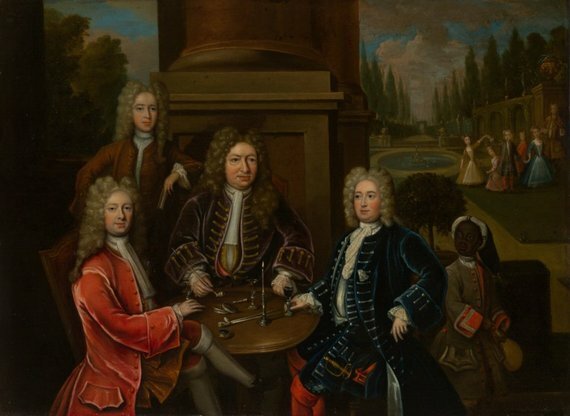 Consider this painting from the Yale Center for British Art. Elihu Yale, the namesake of Yale University, is clad in a mauve velvet jacket and powdered coiffure. He sits at the center of a table decorated with items procured from Britain's thefts abroad. His hefty face commands my gaze, and his jacket button strains against his overfed gut. To the right, blended in the shaded background is a dark-skinned child carrying a wineskin, face turned toward Yale and his guests in a posture of subordination. The padlock around the child's neck signifies the status of a slave. This painting symbolizes the truth that the origins of my university - and my future success - hinged upon the exploitation of black people. This is the legacy I have inherited; in this way, I am complicit in a system of oppression. The news should not serve as a window, but a mirror. Beyond incidents and individuals are systems and structures in which our communities play a role. My task - our task - is to ask and to act: indifference is the cloak of injustice.